Interview by Tracy Van Wagner. Photography by Yashira Afanador. My name is Samira Jaweed. I'm a Muslim-American. I was born and raised in Karachi, Pakistan. I came to the United States in 2000. I have some family members here. When I came, I was young. I met my husband here. We have a son now. I've lived in Cincinnati for 13 out of the 18 years I’ve been in the U.S. It's been great so far. We've seen the city grow, especially the West Chester area. My husband was born and raised in Toledo, Ohio. He's never been to Pakistan. I'm looking forward to that day we visit, along with our son. You realize when you come from another part of the world how different America is. Since I've been in Cincinnati, I would say – besides having extended family – what's been really helpful has been the presence of the Islamic Center in our lives. The Islamic Center started in 1995. They've done a fantastic job in terms of interfaith diversity and outreach. When they started to plan to formally focus on social services, that's where I joined the team. It's been three years now. We've grown quite a bit. I was the first person to come on board as a staff person. Now we have grown to three. It's been a great journey being here, making friends, and getting to know people. Would you mind telling us a little more about that journey? I never imagined I would be living my life here. A little bit of a series of unfortunate events brought me here. My parents passed away pretty young. I'm the oldest; then there’s my brother and my sister. We were at that stage in our lives, in our 20s, about to venture out. When we saw some opportunities abroad, we jumped on those opportunities. My brother went to Canada. My sister got married and moved to England. I came to the U.S.
You realize when you come from another part of the world how different America is. This was pre-social media age. Most of us who had never been here before only knew Hollywood. So, when you come here, you realize: It's just a different world, from driving on the other side of the street to the language. In Pakistan, there's a lot more British English influence. I met my husband a few years later. We got married and decided to stay in Cincinnati and start a family because his family is here. I had gone to business school in Pakistan. My parents had always been liberal. We still had pretty close ties to our religion, our family, and our culture. But at the same time, my father and mother encouraged us to study and to go as far as we could in achieving whatever dreams we had. Right off the bat, I was able to land a job with one of the biggest financial institutions in the United States: JPMorgan Chase. I worked with them for 13 years in different capacities. Being on the frontline and talking to people was fantastic for me because 20-minute appointments would turn into one hour because people would just want to know. That's when I realized the media plays such a big role. I had so many preconceived notions, and they had misconceptions. That work experience has helped me learn a lot about different people from different walks of life. I love it here because people are great; they ask me questions; I feel good, and I have my family and my work here. It's been a great journey for myself. So, when I look at other immigrant stories right now, it's heartbreaking, because that was not my experience at all. I hope other people don't have to go through this kind of stuff in the future. You mentioned that while you worked at J.P.Morgan, people would want talk to you. Can you tell us about any of those conversations that stuck out? At that time, I was not wearing the hijab. So, this is when I looked like anybody else, except maybe for the color of my skin. A gentleman sat down, and, when he saw my name, he said, “Where are you from?” and the conversation starts. He leans back in his chair and he's like, “I’m a Christian. Do you think I'm an infidel?” Unfortunately, that was the time around which the Taliban and all were really being in the media. That was extremely heavy as an individual to now be a representation of the entire religion and to have knowledge about politics, geography, culture, and religion and have a comprehensive answer. I had to learn fast to answer those questions. In that circumstance, I think my original reaction was, “Oh, gosh, no!” I was confused why somebody would ask me that. Here I'm thinking, “Hey, I'm just your average American-Muslim person, your banker, your neighbor.” So, I would point out how certain people do not represent the entire religion. They don't even account for 0.01 percent. And there have been similar stories in other religions and cultures in the past. That discussion in itself was really interesting, and that client became a good friend over time. Women are independent. They're highly educated. They're pilots, engineers, doctors, lawyers, and in the media. On Christmas time, people would come and I'd bring in cookies and things like that. A lot of times the assumption is everybody celebrates Christmas, and that was another piece of conversation you would have. Well, right now maybe it's more of a commercial holiday, but we think of every holiday more so on a religious basis. So, I would have that talk with them and then they would ask about Ramadan. I mean there's so many stories on different types of conversations I've had with people, just learning – people coming in then trying to wish you “Happy Ramadan!” and things like that. It's heartwarming. What are some things that you would want people to know about Pakistan? It's like any other country. You have to travel. So if you meet somebody from the midwest, the south, or the northern part of Pakistan, the cultural system is going to be different and their experience is going to be different. They're going to be representing a different personality and a different lifestyle. I grew up in Karachi, which is the most populated city in Pakistan. There is a lot of cultural diversity. A lot of people would move to Karachi for job opportunities. So, you grew up with an extremely open mind, already aware of different types. A lot of people think: It's an Islamic country; they're not progressive; women are subdued; you have to wear the hijab. None of that is true. I never wore a hijab myself up until I came here and actually learned for myself and wanted to do it. I would never do it if anybody forced me to. My father never did; my husband never did. Women are independent. They're highly educated. They're pilots, engineers, doctors, lawyers, and in the media. Yes, there is poverty. Yes, there are challenges. It's a considered a third world country because it's fairly new. I mean, if you look at the rich history of America of 200-plus years old… That country is only 50 some years old, so it will take them a while to get there. There’s a lot of talent. People love sports. Just like here, you have crazy fans of sports. People love food. Just like here, we all love to eat. People love their families. I mean, it's just exactly like any other country would be, except for the certain parts that have been marred by certain unfortunate situations like bombings and things like that. It's all of that. Pakistan also has a lot of natural beauty. You see these Europeans who have a 20-minute video on different channels saying, “Come to Pakistan! There is snowboarding and skiing!” They're having a great time! There's mountain ranges, beautiful lakes, and city life. There’s a lot to do there. I'm super excited about the new prospects of the new government in the election recently. I'm looking forward to some really good advancements economically, technologically, socially, and culturally there. A lot of people – especially the young generation – have realized that education is the key to success. So, a lot of new organizations are around education, healthcare, and women empowerment. There are organizations that are building schools in remote villages, in areas where nobody has access and girls have never gone to school and things like that. Fashion industry, too, by the way – we are one of the biggest cotton producers. So, fabric, the material, the colors, the fashion; it's huge. If you ever Google that, you'd be amazed! What brought you from the banking industry to the Islamic Center? I was growing as a Muslim American, so I was learning a lot about my religion. I was learning about certain things that are forbidden in Islam, usury and interest being two of them. The more I read about Islamic economics and finance and thought critically on it, it just wasn't sitting well with me. Also, what is my legacy going to be for the second half of my life? My son is now growing up, so I wanted to do something different. But I had not planned the Islamic Center at all. I was looking at the nonprofit world, but I wasn't sure how to even begin that journey. At that same time, it just happened that they were thinking of expanding and bringing on staff. They reached out to me, and I said yes. I bring a more corporate, financial, MBA, for-profit type of background, which is unique and appreciated here. But then I myself have a lot to learn from all the amazing volunteers and people who have built this institution. Learning the commitment and going beyond the literal sense of service to the spiritual aspect of it from my team… Making sure to keep connected with the people whom we are serving… I have a great team! 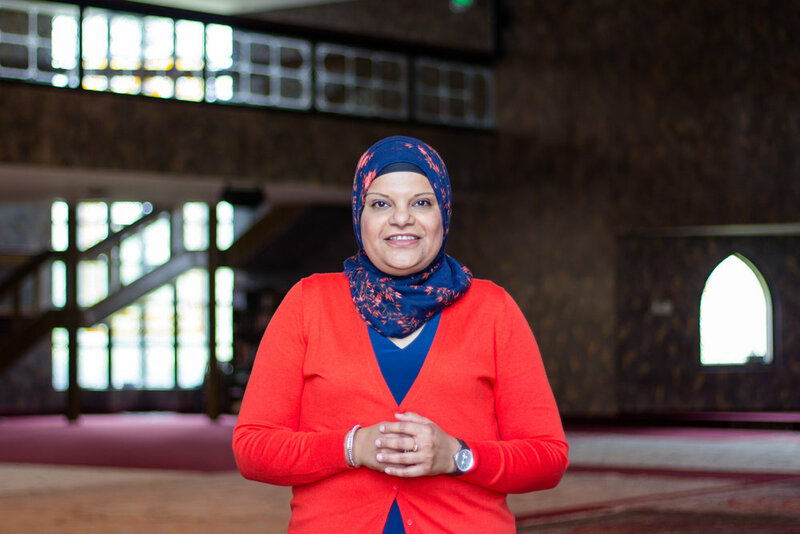 A lot of people to support me: the board, the president of the Islamic Center: Shakila Ahmad – she's the first female president of any Islamic institution in the United States. She's been doing that for the past two years, but she's been part of the Islamic Center forever and been on the board for a very long time. She is on the board for various organizations in Cincinnati, such as United Way, Y.W.C.A., etc. I think that's been really a great example for all of us women in this community. I'm extremely happy where I am right now! It's been a good transition. Please tell us about the work you do. To start out, I’ll backtrack a little bit to give you a bigger overview of what the Islamic Center is like. The I.C.G.C. started in about November of 1995. Early ’90s – the pioneer behind this was Ahmad Samawi. His vision was to create an organization that would not only cater to the local Cincinnati area but the greater Cincinnati area, Ohio, and nationally. The I.C.G.C. comes under the [International] Islamic Educational Council, and their focus long-term is on outreach, education, interfaith, and service. I am the service part of it. People – usually when they drive by – think it's just a mosque. But there's also an educational building where there are seminars, workshops, and different activities. Then, there is a full-time school, which is from preschool all the way up to eighth grade. And the community center. So, there is a lot going on here. People look at the I.C.G.C. as the go-to place for new Muslims moving into the neighborhood. It’s also where those in need who don’t know where else to turn to can go. Over time, a lot of social work was being done. To formalize it, Rahma Community Services started in February 2014. In 2015, they hired me as a part-time program manager. I was doing a lot of different things, wearing a lot of different hats – anywhere from grants to programs to operations. Currently, I am the operations manager. I'm still wearing some hats here and there, but mostly my focus is to strengthen the infrastructure and organically grow to a point where we can leverage different funding options and grants and volunteers, and then focus on things that people need right now, such as employment, education, mental health, and refugee services. Those are our core focus areas right now. There are a lot of different teams that are working together. We're in that process where we're trying to grow, and at the same time manage that growth in a way that is sustainable long-term. Right now, Rahma is serving mostly marginalized Muslims who are falling through the gaps, but that's because they already come here. We never turn away anybody based on religion or race. We never even ask what their religion is. We always help. What would you want people in the Greater Cincinnati area to know about the local Muslim community? First, I would say reach out to a Muslim and just connect with one of us and ask us questions. We will not take offense to being questioned. That's how the conversation grows. I would invite them to the I.C.G.C. I would invite them to Know Your Neighbor. Please come with your family, your colleagues, and your neighbors, and get to know the Muslim American community and the neighbors here. There is a lot of diversity within the Muslim community. A lot of people think of Muslims and Arabs. But a majority of the Muslim countries are non-Arab. If you look at Indonesia, Malaysia, and Pakistan, there's a lot of other countries where you have Muslim populations and they're not Arab. Within the community itself, there is a lot of diversity – from cultures to the way we look, the way we dress, the way we eat our food, and to our languages. Come and explore and see for yourself how different we are within our community and ask us questions. When you come to the communities, it represents what we’re really all about: family. You’ll see men, women, children, and seniors. There's different types of programs, sports, education, and celebrations going on after Ramadan. It's just like any other community. Our needs are the same. The dreams are the same. Have you ever thought about going to Pakistan to live and do the kind of work you’re doing here? I have, but my husband and son were born and raised here. My husband’s parents – absolutely everybody is here. There is no way, practically, that's going to happen. Could I go back and forth or start something of an initiative? Yes. Since I've been involved, and as we've seen the world overall change, there has been this desire of late. You're hitting on something that's kind of new, and I’ve been dreaming of that. There are some amazing women in our community who are already doing a lot of fundraising for that effort. There are organizations they’re partnering up with, and they'll collect funds; it's mostly donations. There are other individuals who will not only collect the donations for education and other women's rights, but also partake in the construction of a school in their local village. A lot of small-scale work is being done. On a bigger level, I recently learned about an organization: American Pakistan Foundation. They're doing some really good work. Would you please tell us about a woman who has had an influence on your life? Without a shadow of a doubt, my mom. She sacrificed so much for us. I guess all mothers do. I'm not even half the mom she was. Not only did she empower us as girls; she never differentiated culturally, religiously, in any way. She allowed us to grow. She was, at the same time, extremely strict. But a friend and a parent is a combination that, if you are a mom, you know doesn't come easily. You have to work at it. We could be scared to do something, but at the same time, she would be our go-to person for everything, and we would talk to her. That kind of respect, she earned it. It wasn't like she was asking for anything. That kind of personality, I don't know how it comes to you. I think over time and experience. I wish and hope that my son looks up to me one day – based on his experiences and how I've nurtured him and helped him grow as a person – and at the same time, I'm his best friend. A lot of people ask me, “If you have some test in your life, how do you keep smiling?” I saw my mom go through stuff. She lead by example, and she had that spiritual aspect of faith. There is the other aspect where you perform rituals and do whatever you have to do. But truly believing that God is there? Not a lot of people do that. I'm at peace with a lot of things because she was a role model in that sense.